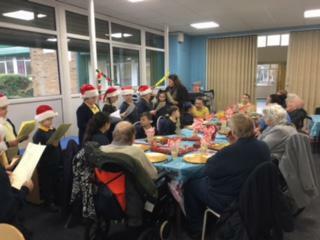 Each year we invite members of St Nicholas’ Nursing Home to come and have Christmas dinner with us, and this year was no exception. Children from the School Council set up the tables and decorated them in readiness for our special visitors. 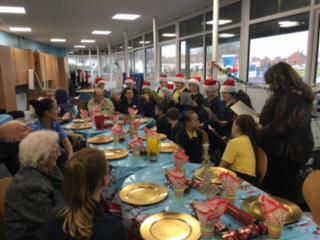 The whole school was enjoying Christmas Dinner and so it was lovely to share this with others in the community. Our children served dinner and were running up and down between tables making sure everyone was happy. I was so impressed with how polite they were and how well they contributed to the conversations on the table. We had lovely feedback from our visitors and the nursing staff who were supporting them.